Google Analytics Admin Access: Best Practices for Ad Agency clients? (b) have your master Google Analytics account and add a new Property for each Client. The first makes the case that each client’s GA account is their own asset, and supports a clean separation between each Client (i.e. the “Each Client has their own Account” rule). The other opinion counters that if each Client has their own property under your “Master Account”, you can just grant your Clients access to that property (i.e. the “Master Account” rule). In this Article, I’ll explain why I believe you should always aim for clean separable accounts, and how to set that up. The data belongs to the Client. Each Client should have their own account. It’s better for both parties to be able to walk away cleanly. Analytics for Agencies: What are Best Practices to set up Client accounts? Your Client should then add you to their Google Analytics (GA) account as an Administrator. In the unlikely even that your client doesn’t yet have Analytics set up, just ask your Client to signup for a Google Analytics account, and then get them to add you. Why should my Client own the Google Analytics Account? Because, if later they choose to switch to a different agency, this will allow your Client to remove your access. Its better they have control. Admin Access: Does our Digital Agency need to own the Google Analytics Account? So long as you have Administrator rights (i.e. Manage Users + Edit, see below), you will have the same access. But if we Own the Account, won’t our Clients will stay with us? Don’t waste a second thinking about this. Your client will stay with you because you do an awesome job and create loads of value for them with the (Adwords or Facebook or Content) Campaigns you run for them. Period. Google Analytics admin access: How does Your Client give you access? Its easy for your Client to provide your Agency with Google Analytics admin access, and takes a few seconds. 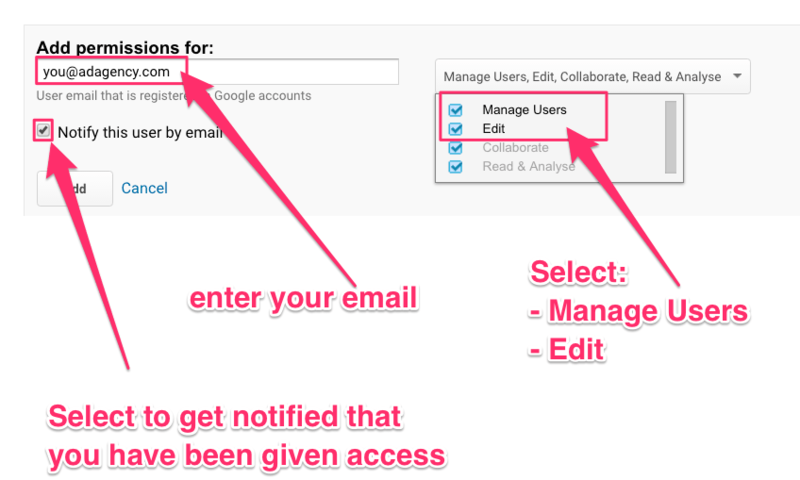 Open the Admin Tag, select Account, select User Management, and enter the details. Ensure your client selects Manage Users and Edit. 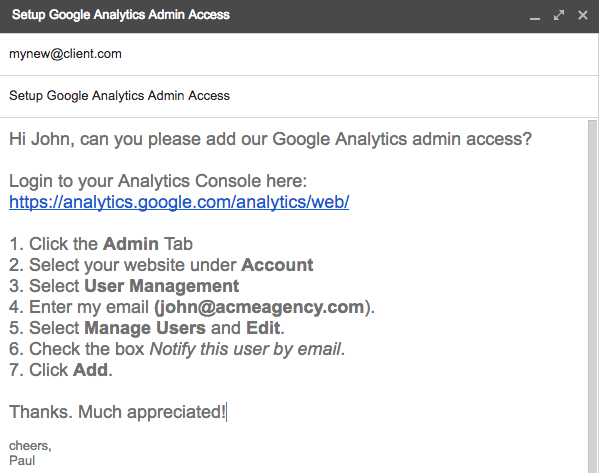 Hi John, can you please add our Google Analytics admin access? Select Manage Users and Edit. Check the box Notify this user by email. If your Client doesn’t already have Analytics, an alternate is to create a new Gmail account to share with your Client, e.g client.analytics@gmail.com. You would then create a new Google Analytics account with that Gmail account. Once that email has been set up you can also add team members from your Client and your Digital Agency (as explained above). This can be more convenient for the Client, as effectively you are doing all the setup work (and providing a great service). Plus, this method allows you and a clean exit from the account should the Client ever change agency. UPDATE: (Hat tip to Sam Steiner for this one!) 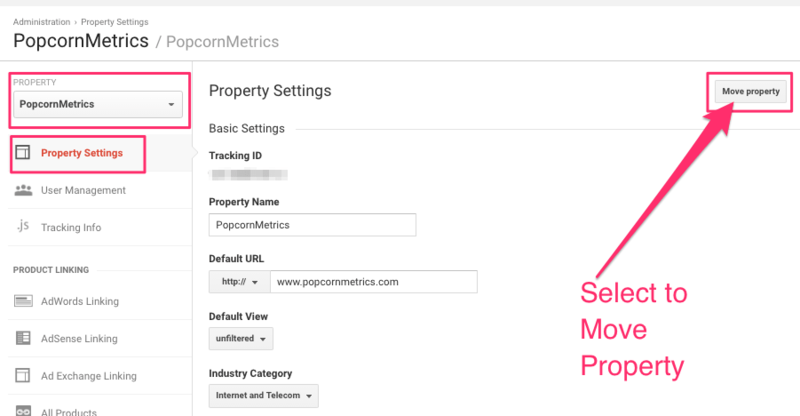 You can now transfer Properties from one Google Analytics account to another. This means you can set up a Property for your client in your Agency Account. And THEN, when everything is setup you can transfer that property into your Clients’ account. According to Google, you’ll need to have privileges in BOTH accounts to make the transfer, and you can read more here. NOTE: The GA tracking ID (e.g, UA-12678-1) is unchanged, so you won’t need to retag your Clients’ site.